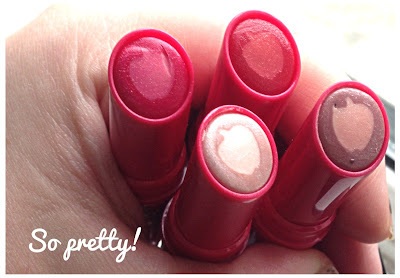 Lipstick terrifies me, yes you guys already know this, but wait till you see what I have today! I'm dead excited about these! Aren't they just lovely? 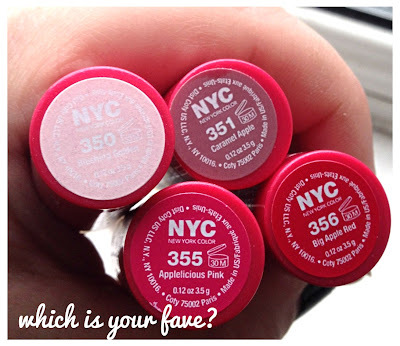 These are the new Applelicious lip balms from NYC they have colour and they moisturise. They're like wearing a lipstick without all the drying, precise faff of wearing a lipstick. I'm genuinely beside myself with joy about these. Here's the colours! Big Apple Red and Caramel Apple are my favourite. The pink really packs a colour punch though. I think I thought initially 'oh they're just balms there's not going to be much colour'. Not so! 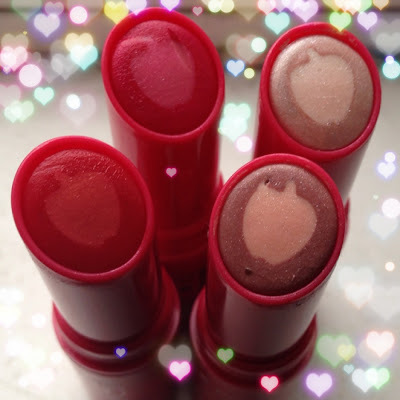 Here we are in daylight, I love the tonal balm in the middle, it seems to line and highlight the lips all at once. Now my favourite bit! Look at these colours on my lips are they not just gorgeous? They're all glowy and pretty, this is just daylight, no flash no nonsense or filters. Look how moisturised and balmy they look. Argh I just love them, isn't that colour fabulous? Also do any of you find yourselves saying caramel apple like you're in Enchanted? Keeeeramel Eppple. I'll stop it. Anyway they're £2.49 and that's just craziness because they're awesome. I've been wearing Big Apple Red and Keeeeeeramel Eppple every day since I got them. Enough of my raving on, check them out folks!